Another week, another fascinating study tour for the World Forest Institute (WFI) International Fellows! 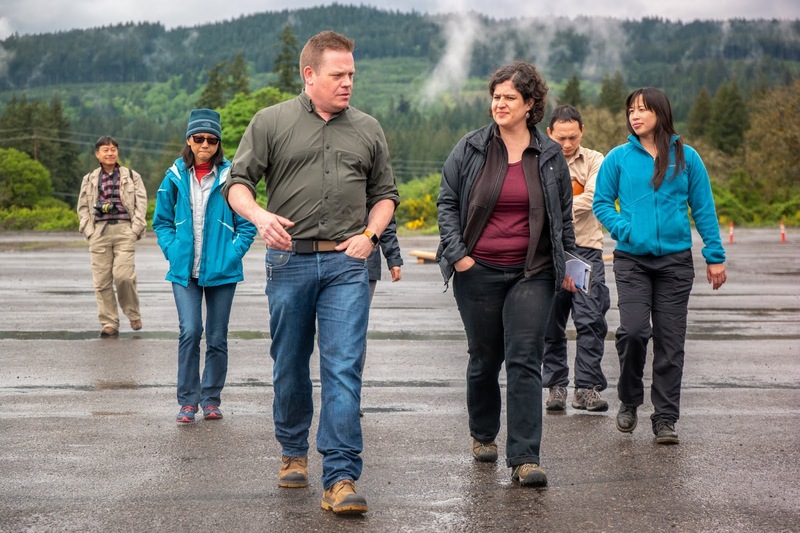 In late May, the Fellows visited Hampton Lumber in Willamina, Oregon and were given a guided tour by David Hampton, co-owner (along with his two siblings, Elizabeth and Jamey) and board member. Hampton Lumber is a third-generation, family-owned company and currently has 300 employees. The company was started by David’s grandfather, Bud Hampton, in 1935 and now includes nine sawmills in the U.S. and two in Canada. The sawmill facility in Willamina was purchased in 1942 and currently includes two sawmills: a quad mill built in 1970 designed for 34”-diameter logs and a curved-saw mill from 1997 designed for 18”-diameter logs. Over the years, the Willamina sawmill has changed greatly in terms of safety. The facility has shifted away from production to recovery, and the company has shifted from awarding production bonuses to safety bonuses. This facility is now the top-producing sawmill in the U.S. and ranks 8th globally, with roughly 20% of production used for export to Taiwan and China. Very impressive! Of course, such high production levels require large amounts of raw materials, along the order of 150 log trucks daily. Hampton Lumber owns over 140,000 acres of forest, but this produces only 10% of the company’s consumption. To fill in the gap, Hampton Lumber purchases timber from the Oregon Department of Forestry, various timber investment management organizations (TIMOs), and small woodlands, engaging in sealed-bid sales when competition for logs is high. Three weeks’ worth of inventory is kept on-hand at the sawmill. Many thanks to Hampton Lumber for your hospitality and for sharing your knowledge! Organization: Freres Lumber Co., Inc.
On May 10th, the World Forest Institute (WFI) International Fellows were given the amazing opportunity to take an in-depth tour of Freres Lumber Company, Inc., a family-owned and operated business specializing in advanced wood products located just a stone’s throw away from Portland in Lyons, Oregon. Tyler Freres, Vice President of Sales, generously spent a half-day with the Fellows, teaching them about the company’s history and leading them through various on-site production processes, including veneer, plywood, co-generation, and one-of-a-kind mass plywood panel. Freres Lumber Company, Inc. was founded in 1922 by Tyler’s grandfather, T.G. Freres, and is now the largest independent veneer producer on the West Coast. The company has steadily grown since its establishment and currently employs 480 workers. Eighty truckloads of 10” and 16” diameter logs cut to 8’, 9’, and 10’ lengths are needed per day to keep Freres’ veneer plant running at full capacity, though the company keeps a three-week inventory on-hand as a cushion. 90% of these logs comes from land under federal ownership, such as the U.S. Forest Service and Bureau of Land Management. Freres’ veneer plant produces 150 truckloads of veneer weekly with their peak operating season being from June through September. Only 10% of the veneer produced is used in the company’s plywood plant; the other 90% is sold in the open market, both domestic and export. Products must be heat-treated before they are cleared for export. Veneer production from whole logs allows for 90% log recovery, meaning very little wood waste is produced. What little wood waste is produced is fed into the on-site co-generation plant. This efficient use of wood waste produces enough energy to meet the electrical needs of Freres’ veneer, plywood, and mass plywood panel plants as well as that of 5,000 local homes. The highlight of the tour was a walkthrough of Freres’ brand-new mass plywood panel (MPP) plant. Freres broke ground on this plant just last March, and it was already producing its first panel by December 2017. The MPP plant currently has 8 employees, is highly automated, runs one shift daily, and uses about 30% of the plywood produced by Freres’ plywood plant. MPP consists of numerous layers of plywood glued together with cold-pressed melamine adhesive. Because of this layered composition, MPP is dense and considerably fire-resistant, making it suitable for use in tall wood structures. Sheets of plywood are conjoined end-to-end via structural scarf joints that are nearly undetectable visibly. Depending on the end purpose of an MPP product, the plywood layers can be configured in various ways so that the final product achieves certain span and shear strength capabilities. Freres is currently working on obtaining APA and ICC certifications for their MPP products so that they can be used for structural purposes; meanwhile, the company is marketing their MPP for non-structural construction uses. The Fellows were greatly impressed by the degree of innovation and efficiency on display at Freres. Many thanks to Tyler and his team at Freres for sharing their knowledge and expertise with the WFI Fellows! 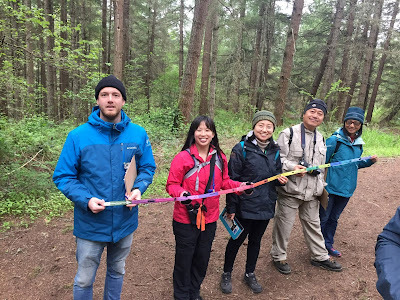 The World Forest Institute (WFI) International Fellows’ schedule has been jam-packed with interesting and educational activities since arriving in early April, including weekly tours to local forestry-related businesses and sites of interest. One of the Fellows’ first tours was to Port Blakely’s tree farm located in Mollala, Oregon. Port Blakely is a fifth-generation, family-owned, Sustainable Forestry Initiative®- certified company that provides log products to mills and log brokers throughout the Pacific Northwest and around the Pacific Rim. They manage the ecosystems in which their products grow with respect to provide renewable forest products around the world. By far, the highlight of the Fellows’ visit to Port Blakely was getting the opportunity to see Port Blakely’s Environmental Education Program in action. More than 87,000 Washington and Oregon schoolchildren have participated in this program through classroom study and field trips to discover firsthand the benefits of a working forest in a fun, safe environment. Port Blakely provides grants to local schools to cover transportation costs to their tree farm. On their tour, the Fellows accompanied Bonny Glendenning, Port Blakely’s Environmental Educator, as she led a classroom of fourth-graders through the forest, teaching them about tree identification, forest stewardship, and carbon sequestration. WFI International Fellows and Vivian Bui, Professional Programs Coordinator, holding an example of Port Blakely’s custom-designed “carbon capture” tape, an educational tool used to teach students how much carbon can be captured in trees depending on their diameter. Thank you, Port Blakely, not just for the tour, but for all that you do in educating future generations about forest stewardship! Interested in setting up a school tour to Port Blakely? Click here!